PLEASE NOTE: This issue takes place DURING the episode "Schooled". Artemis is at a dead end. Her life is at a snail's pace and it doesn't brighten up waiting at the bus stop for her mother, Paula, to arrive from a stint in prison. As her wheelchair rolls off the bus ramp Artemis greets her and apologizes for her father's absence. Later in the evening Artemis is preparing arrows, sadly that will never see action however much she dreams of being a super heroic archer. Her daydreams are interrupted by the arrival of her father. Face to face with Paula the arguments quickly flare as Artemis watches on through her bedroom door. As she listens to her parents she hears how her mother became paralyzed from the waist down taking the blame for her father's actions. She also learns her sister was lost (through death or running away is not clearly revealed). Her father similarly fires back that he had been training Artemis for a life as an archer during the six years Paula was away. In anger of her parent's actions, Artemis suits up in her emerald costume. Racing out into the night she is quick to embrace fighting crime on the streets of Gotham. Pondering her brand new life is short and sweet as Superboy hurtles into Gotham Academy. Skulking in the treetops nearby Artemis watches as Robin, Kid Flash and Superboy take a beating from Amazo. Scanning the area she notices a man, Professor Ivo, watching his droid's handywork, worse still she realizes the man is a good friend of her father! Before she can intervene Artemis is surrounded by M.O.N.Q.I.S ready to attack! Story - 5: Yet another issue that hits a home run! The creative team has continually delivered superb accompanying stories that expand on story elements that just can't be dealt with in a twenty minute episode. 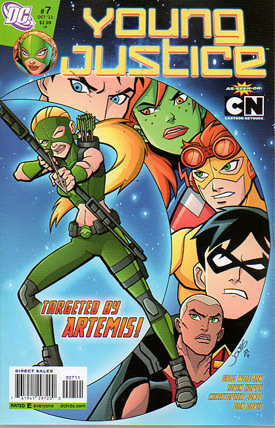 I honestly hadn't cared much for Artemis in the show but now, besides Superboy, she is the most fleshed out of the team with as much mystery to her as him, making her a quick favorite. I was getting a little antsy that she wasn't in the first six issues but I'm looking forward to finding out more in both the book and the show. Art - 5: While Mike Norton's style has grown quickly and favorably, Christopher Jones has quickly embraced the book's animated world. I loved all the strategically placed shadows, objects and framing that hid the identity of Artemis' father. Reminded me of the old days of the Tim Allen sitcom Home Improvements! Cover Art - 5: Artemis takes centre stage and nudges the rest of the team into the moon's shadow. A really nice debut for the long overdue wildcard.